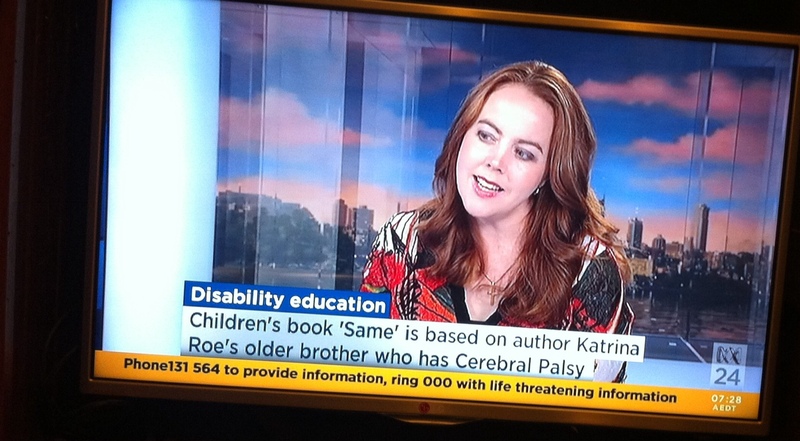 It’s been a busy time promoting Same in the media all across the country. In the past few weeks I’ve talked to 96five in Brissy, chatted with Outback Radio 2WEB, and appeared on ABC News 24 Weekend Breakfast with Matt and Miriam. It was my first time ever on national television so I was nervous for about 2 weeks before! This probably seemed a little ridiculous to my hubby, who used to read the news on Sky every day! I didn’t stuff up too badly, except the moment I said ‘maked’ instead of ‘made’. What was I thinking? I blame hanging out with 3 year old, who regularly says things like ‘I eated all my dinner’ and ‘I goed to the shops’. Since I said the word ‘maked’ on national television, I’ve discovered that I often used her 3 year old speech patterns, and have found myself eating ‘tussert’, wearing ‘tujamas’ and saying something is ‘tusgusting’! 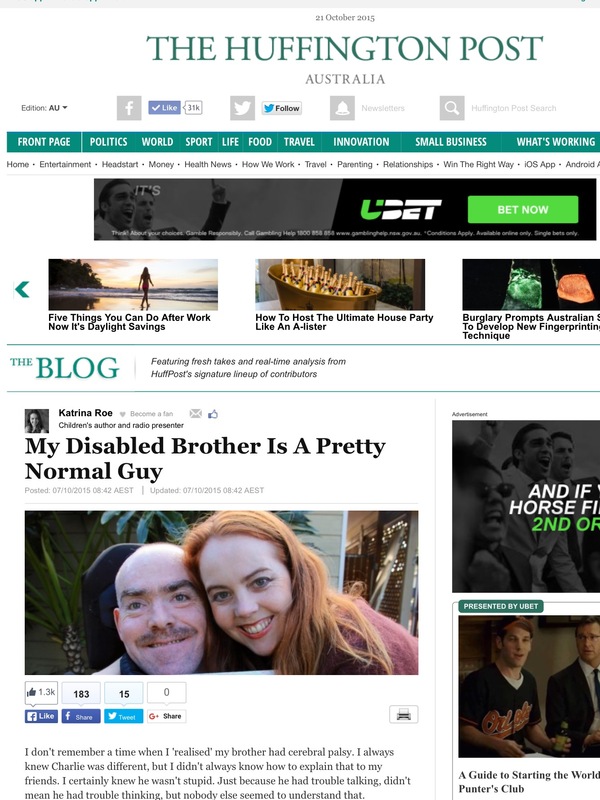 Oct 7 was World Cerebral Palsy Day and I was excited to have a blog post on Huffington Post. This got a great response with a lot of traffic on the day. 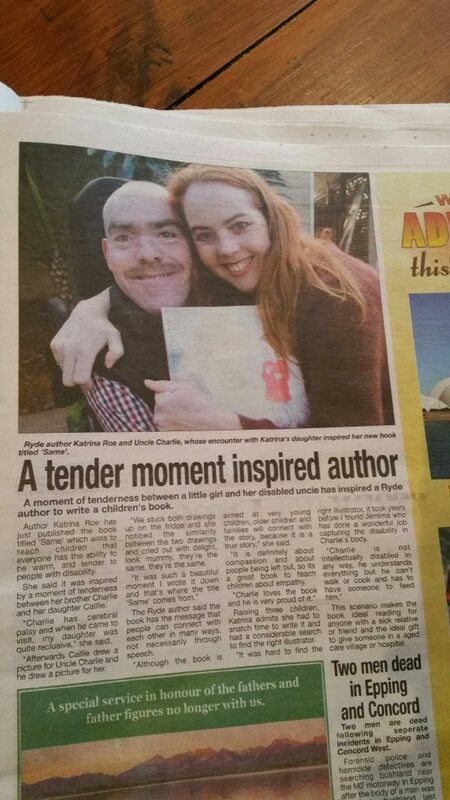 I went over to visit my brother Charlie at the end of the week and read the post aloud to him. I was a bit worried about what he’d think, but he really teared up at the end and I knew that he was proud of it. For the next few weeks I’m visiting some schools and preschools with Same. 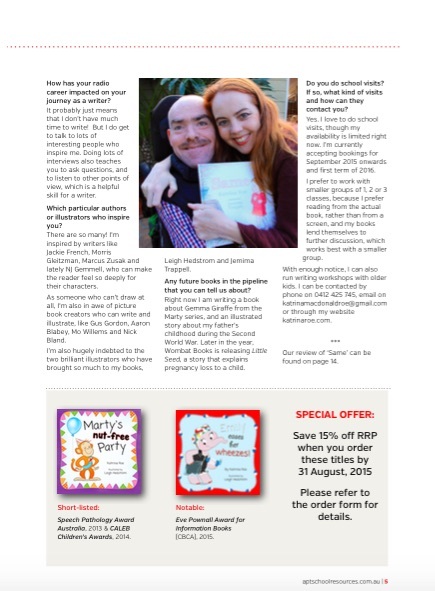 If you would like me to visit your school or preschool, please get in touch through the contact page of this website. I was so excited when my copy of The Book Curator magazine arrived in the mail earlier this month. It was one of the very first published reviews of Same, even before the launch. The Book Curator is published by Apt School Resources who supply books to many Australian schools, particularly private and Christian schools. Rowena Beresford has become a friend of mine (through our shared love of children’s books) and I knew that she had a heart for Same from the start. But it was still a thrill to see this lovely feature and review. It was also a bit of a shock to realise that I now actually have three books out! How did that happen? 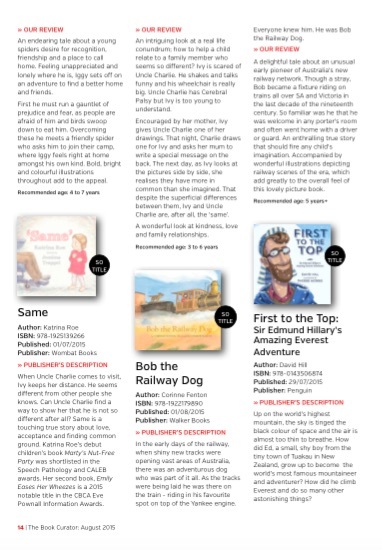 There was also a recent review by Julieann Wallace on Creative Kids Tales which you can read in full here, but I’ve copied just a little of it. 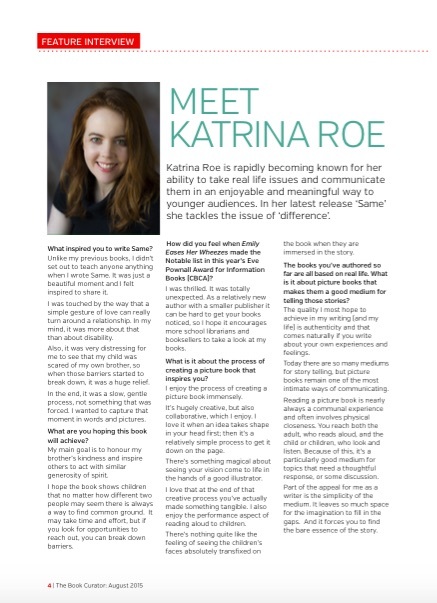 ‘Katrina Roe has written a touching story for children up to the age of 7, that explores love, acceptance and finding common ground, showing that we can be different but the same. Her story is beautifully illustrated by Jemima Trappel, who has used colour to complement the feelings of Ivy, the mood of colour changing with Ivy’s journey through acceptance. Jemima has also captured Ivy’s anxiety with perfection in her portrayal of facial expressions, to the happiness of acceptance and finding something the same. Thanks Julieann! I do agree with how perfectly Jemima has captured Ivy’s moods. Awesome work Jemima! CBCA Book of the Year Awards 2015! While awaiting the imminent birth of my third child (any day now) I decided to take a hike on the Bay Walk in Sydney’s Inner West. (My mum had called me the day before and mentioned that a long walk around Centennial Park had kicked off her labor with my sister forty-something years ago.) It was a glorious day, the sun was shining, my eight-year-old was charging ahead on her bike, my three-year-old resting contentedly in the pram and even though I am currently the size of a whale, I was very much enjoying getting some exercise and fresh air with the family. So it was a wonderful and much unexpected surprise to see that our latest collaboration, Emily Eases her Wheezes had made the ‘Notables’ list in the Eve Pownall Award for Information Books, alongside 15 other beautiful new Australian books. It was also pleasing to hear that the CBCA President commented that the category was particularly strong this year. We were listed alongside books by the major publishers like Penguin, Walker Books and Allen & Unwin. Congratulations to all the other authors who made the Shortlist and the Notables list. As expected, many of Australia’s favourite authors and illustrators are there: Jackie French, Margaret Wild, Libby Gleeson, Alison Lester, Aaron Blabey, Freya Blackwood, Robert Ingpen and Stephen Michael King, but a special mention should go to new authors such as Clare Atkins and Lesley Gibbes – what an incredible achievement for them! Congrats! You can see the full CBCA Book of the Year, 2015 list here.